This is one of those very rare occasions where I remember enjoying a movie immensely when I was a kid, and then looking back at it as an adult and thinking it has either not aged well, or it was my eleven-year-old brain that supplied most of the guffaws. It could’ve been that I had seen Class Reunion right after seeing Vacation (now considered a comedy classic) and was not impressed. I’ve never been to a class reunion. Never been invited. Because of the reckless and impulsive behavior of my mother, we often found ourselves packing and leaving so I never had the opportunity to finish in schools, nor was I privileged to have a stable mailing address. 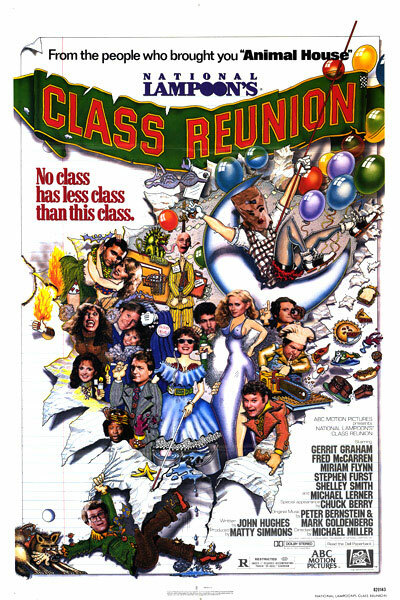 I’ve certainly seen enough movies and television shows about class reunions. My wife was invited to class reunions, but she didn’t have a much of a desire to attend, either. Something about those gatherings seems sad to me. It’s a reminder of age, having to grow up, having to not be what you were when you were young. Some of those sentiments are touched upon in National Lampoon’s Class Reunion, though very briefly because this is a silly comedy/spoof of horror movies. Several movies of this type were released in this time period, notably Saturday The 14th, Love At First Bite, and Student Bodies. Attendees gather for the 10-year class reunion at Lizzie Borden High. The cast is filled with familiar names and faces like Stephen Furst (Flounder from National Lampoon’s Animal House), Miriam Flynn (who would appear in National Lampoon’s Vacation the following year) and Michael Lerner (from Barton Fink). The participants in the class reunion festivities are being knocked off, one by one, and suspicion points to a less than popular kid (played by Blackie Dammett) named Walter Baylor, who was humiliated by this circle of kids on one fateful night ten years before. Gary Nash (Fred McCarren), formerly the guy everybody forgot – even his best friend – takes charge and leads the investigation, with the help of a mysterious doctor (Lerner). Along the way he attempts to woo the girl he was in love with: Meredith (gorgeous Donna Dixon look-alike, Shelley Smith). John Hughes started writing for the National Lampoon print magazine in 1979. His first television credit came in the form of Delta House, the failed Animal House spin-off. He wrote Class Reunion, which tanked at the box office, but he followed it with three brilliant comedy scripts: Mr. Mom, National Lampoon’s Vacation, and Nate and Hayes with David Odell (a personal favorite of mine), which earned him a three-picture directing deal with Universal. Looking at the picture recently, I noted that despite the otherwise funny and talented cast, Class Reunion lacked true comic timing. There is no focus, no lead character to propel the story, nor someone we can identify with. The director, Michael Miller, shoots everything in wide shots to assemble his cast, and good comedy screams for close-up shots to break up the tedium. The jokes fall flat, which is odd for John Hughes. 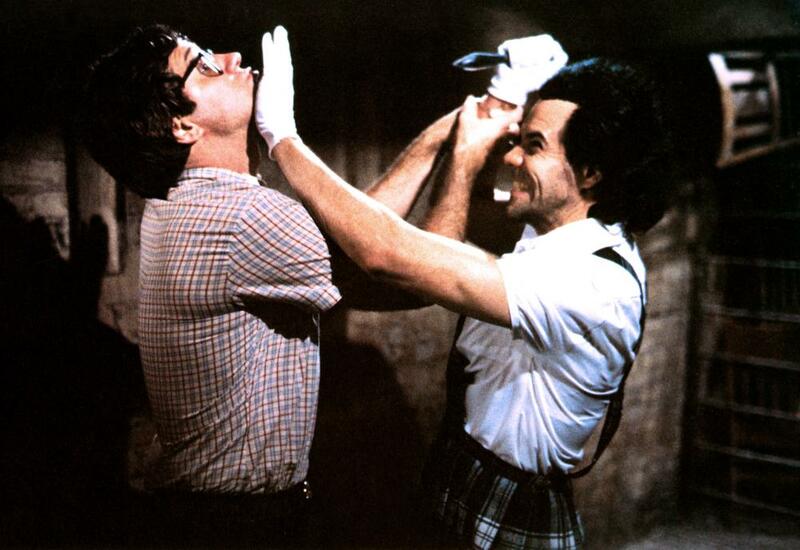 The warmth and humor of his later work is missing here, and this script would be his only dud in the early eighties. His creative output was astonishing. He worked fast, and his pictures were economical. His unofficial retirement began in 1994, and he passed away in 2009 at the age of 59. Next time, we take a look back to the classic era of horror movies on Vintage Cable TV, starting with 1983’s Psycho II!